To be honest, I’ve never really liked Caesar salad, because it seemed too tame for me. What kind of a salad has only pale, crunchy lettuce in it for vegetables? It just wasn’t my veggie-loving speed. But since my husband almost universally orders caesar as his side salad, I figured maybe I should find a way to give it a chance. At first, I tried things like adding shredded broccoli and carrots into it, or chopping a few tomatoes and throwing them on top. But it just wasn’t caesar salad that way. When I realized that he likes kale, and that firm, crunchy kale would make a perfect substitute for bland, watery lettuce, and that it is nutritionally dense enough to make me forget about the lack of extra chopped veg, I knew that a kale caesar would be the winner. Then, I threw salmon on top to turn it into a full-fledged meal (and convince my family to eat fish, which is still a work in progress)! 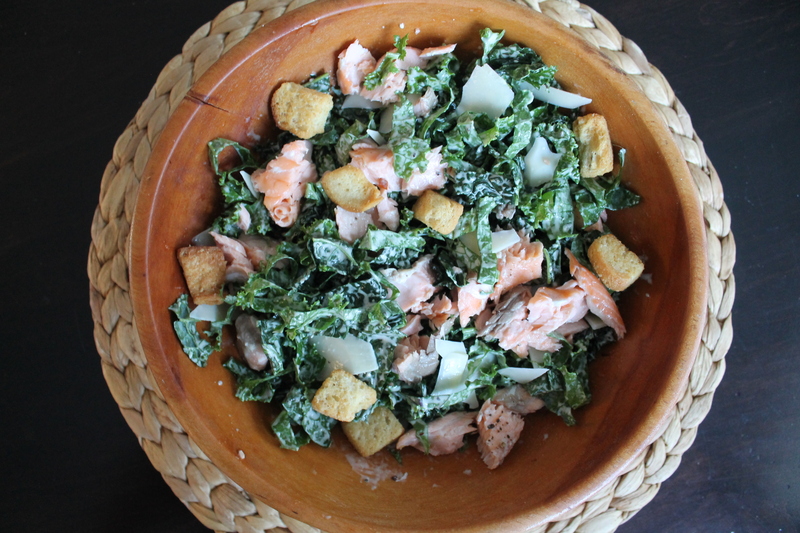 But ever since I succumbed to the simple-is-better philosophy of meal prep—meaning that I realized that I don’t have the energy for more than two recipes at a time so I stopped insisting on making every single element of every meal from scratch—kale salmon caesar has become a frequent guest at our dinner table. So join me! Use all the pre-made ingredients you like. Or don’t. 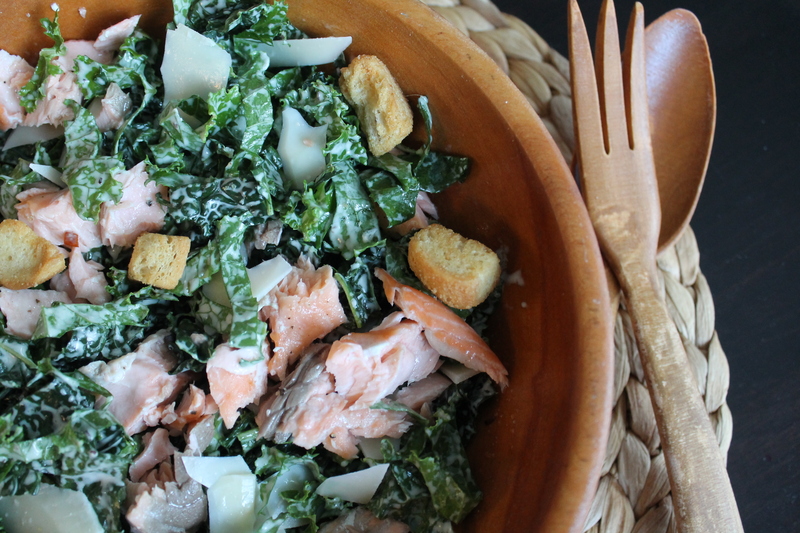 Do it up fancy for date night and sear your salmon skin and whisk your own dressing. It’s up to you. But definitely turn a boring caesar salad into something a little more powerful and worthy of your plate! First, roast your salmon. Sometimes I cut my salmon into individual portions before cooking, and sometimes (like the time I took these photos), I roast the whole flank and just flake it later. Either way works and is about the same amount of effort! Salmon needs to cook at 375° about 10 minutes per inch of thickness in order to be done. I beg you, don’t overcook your salmon. When it is done, it should be soft and buttery, but not gelatinous; it should flake easily, and it may be darker toward the center than on the outsides. 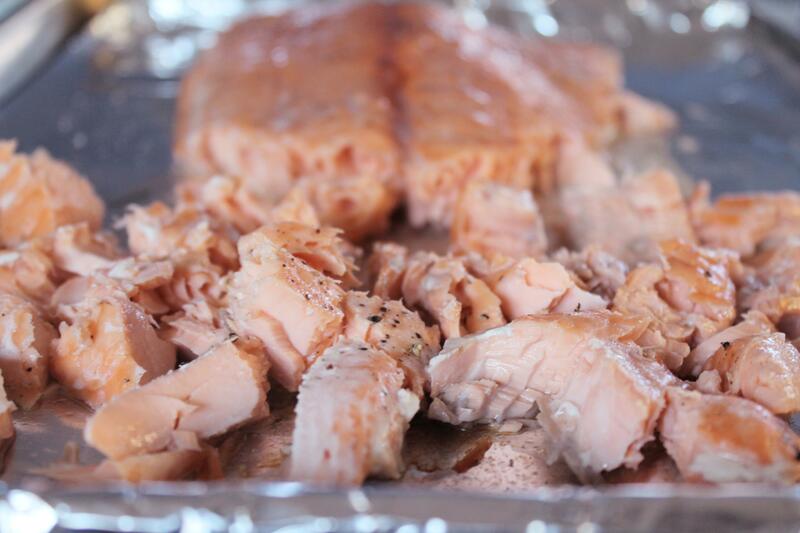 When salmon is overcooked, it is dry and chewy and unpleasant, and it also won’t flake properly! When I photographed this recipe, I actually cooked the salmon in two stages: I roasted it for 10 minutes, then I separated the thick portion and continued cooking it another 5 minutes while I flaked the thinner pieces, which had already finished cooking. By doing that, the whole flank of salmon ended up cooking evenly through to a moist, tender texture. 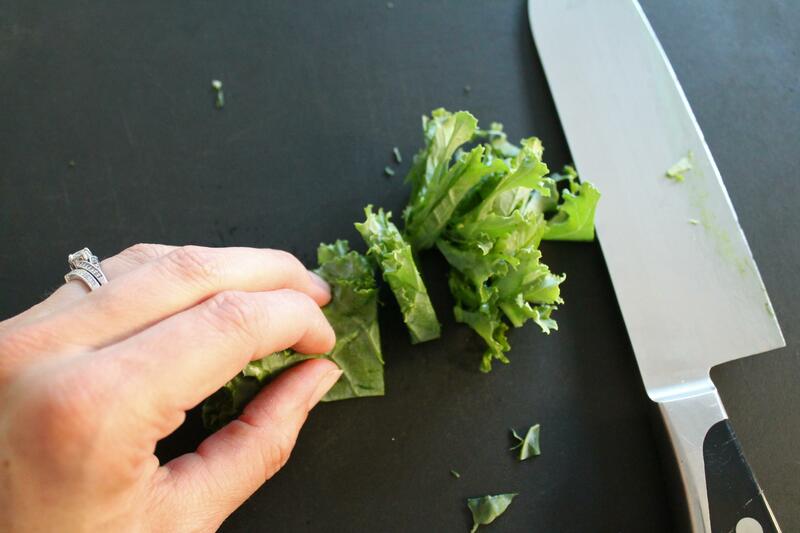 For the salad, de-stem the kale leaves and slice into ribbons, somewhere between ¼″ and ½″ thick. 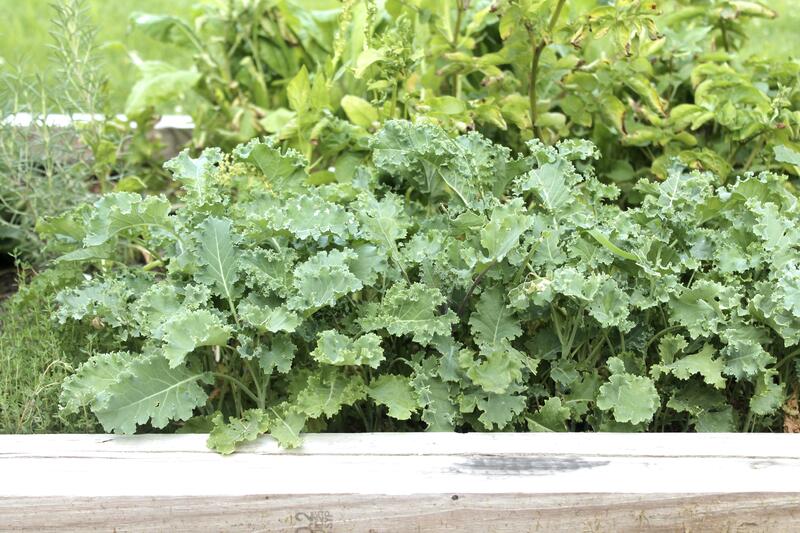 You can use curly kale or Tuscan kale, whatever you prefer! I don’t like to use the pre-bagged chopped kale, because I usually find a ton of thick, chewy stem pieces mixed into the leaves, and I find it much more tedious to sort them out than to simply chop the leaves. Kale, unlike many lettuces, will not start wilting the second you dress it. Kale will, in fact, become softer and less chewy if you rub dressing into it about 10 minutes before you want to serve it! Now that I am trying to have more mercy on myself and make dinner an easier affair, I use pre-made caesars. I usually look for one in the refrigerator section of the grocery store, because those contain less preservatives. Marzetti’s is pretty decent, but Brianna’s is my favorite. I dress generously (part of my compromise for my family is that I acknowledge they love dressings and sauces and don’t skimp) and then I always squeeze half a lemon over the dressing. 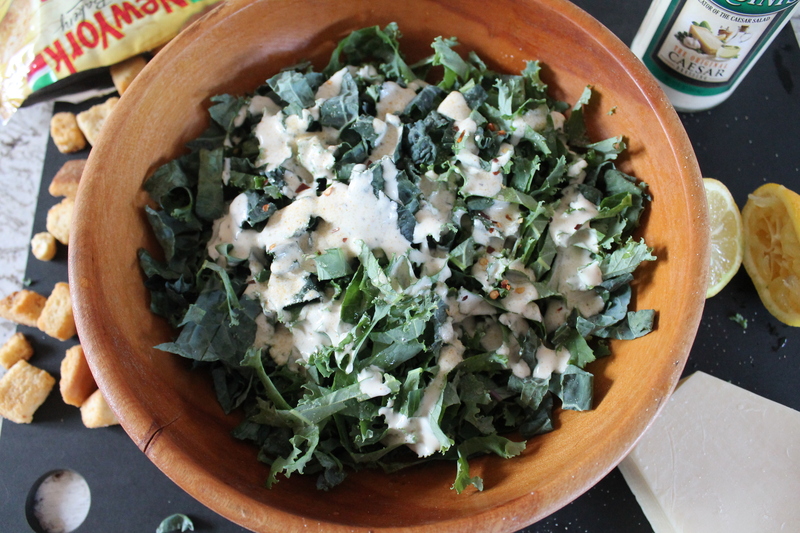 Lemon serves two purposes: 1) it helps tenderize the kale, and 2) it complements the heavy, creamy flavor of caesar dressing and gives it a bright accent. Sometimes, depending on the dressing, I also add a bit of fresh minced garlic or garlic powder and maybe some crushed red pepper. You can never go wrong with garlic! Rub the dressing into the kale. Throw a few croutons on top of the dressed greens. I love Texas Toast Garlic & Butter Croutons! We often crumble them a little, because the pieces are pretty large for small mouths. Grate or shave a little fresh parm over the top. This is where I still put my foot down: I do not like the green can of parm, which, to me, only tastes like the dusty rind of the cheese. It takes 10 seconds to grate cheese over the salad with a microplane, and it is SO worth it! Toss everything lightly together, and don’t forget to add the roasted salmon, which should be coming out of the oven about the same time you finish tossing the salad! Voilá. An entire dinner is ready in about the time it takes to cook the salmon through. Heck, you can even cook the salmon ahead of time and throw it onto the salad cold. You can also eat this meal for leftovers, because the kale won’t turn slimy for several days. It’s just a meal that keeps on giving! Optionally cut the salmon into filets. 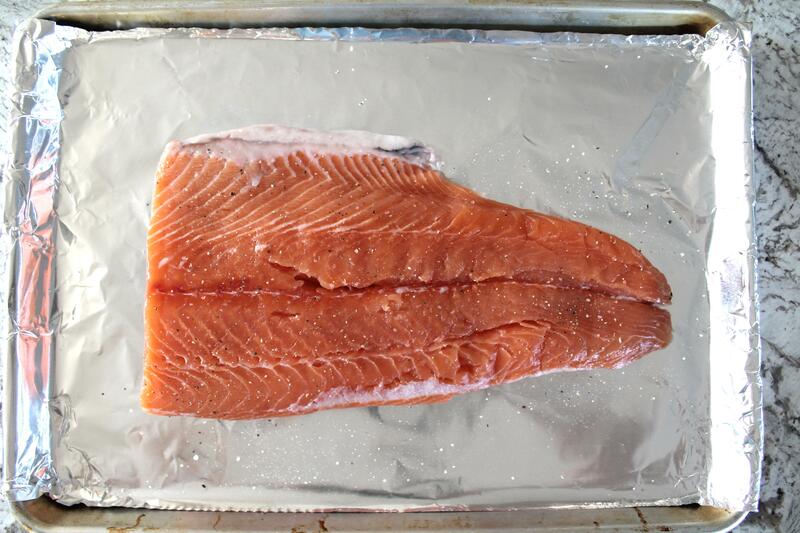 Place salmon on a lined baking sheet and top with salt and black pepper. Roast for 10 minutes per inch of thickness. At the first 10-minute mark, check the salmon. If the thicker pieces are still not cooked through (they cannot flake with a fork), then consider removing any short filets or flaking off any very thin pieces and setting them aside before returning the thicker chunks of salmon to the oven to finish roasting. 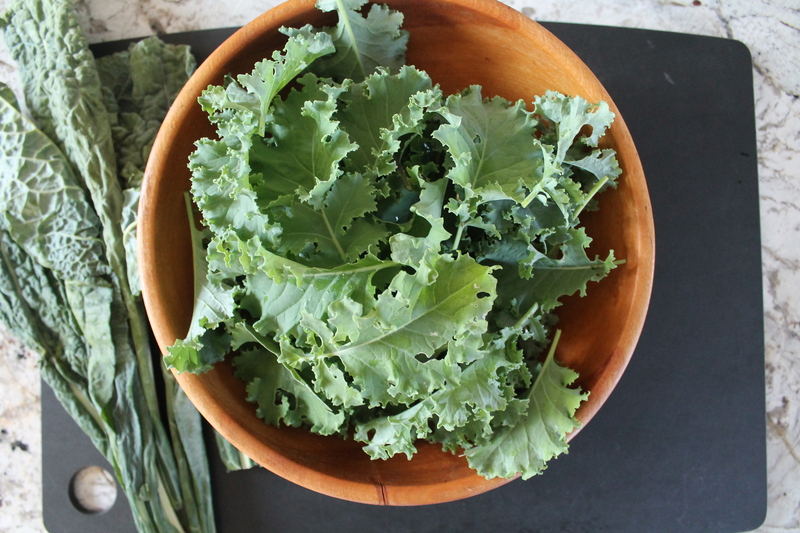 Meanwhile, remove the stems from the kale, wash, and thinly slice into ribbons. Squeeze the juice of half a lemon over the kale, followed by enough dressing to thinly coat the whole salad. Using clean fingers, massage the dressing and lemon into the kale. Taste the dressing and add more lemon or a clove of garlic if needed to achieve a sharp, rich flavor. 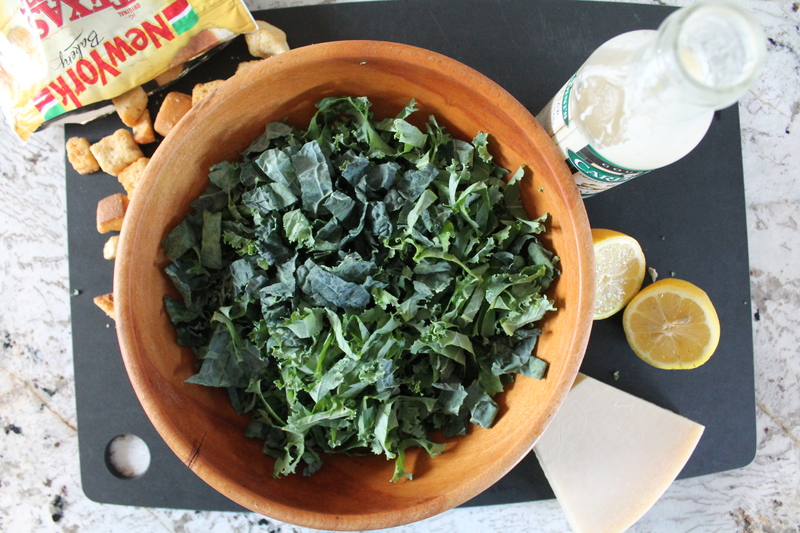 Just before serving, toss the kale with croutons and fresh parmesan. Divide onto plates. Top with salmon (either filets or flaked into pieces). Optionally dress the salmon with extra lemon juice or an extra drizzle of dressing. Enjoy while the salmon is warm! So when you say rub, does that mean you get your hands in the dressing covered kale? I want to like kale so I want to try this recipe!